Elvis Presley sang his last song nearly 40 years ago. But his home at “Graceland,” where Presley is buried, is expanding. Graceland is just a short drive from the center of Memphis, the second largest city in Tennessee. The exhibition center has some of the clothing Presley wore while performing, as well as the guitars he played. Visitors also can see some of the cars he once owned. Jo Ann Taylor of Louisiana, front right, waits to enter expanded Graceland. Presley appeared in 33 movies, and often performed on television shows. More than 20 million people from all over the world have visited Graceland since it opened in 1982 as a tribute to the late rock star. But will visitors keep going there as more people who enjoyed his music when he was alive grow older and die off? Robert Thompson is director of the Bleier Center for Television & Popular Culture at Syracuse University in New York. He predicts Presley will continue to have a large following. He is part of a group of performers -- including The Beatles, Michael Jackson, Frank Sinatra and Bing Crosby -- who remained popular long after they stopped performing, Thompson said. 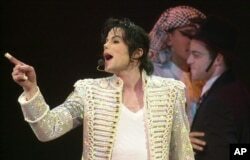 Michael Jackson performing in 2002. “He (Presley) is one of those historical figures that became part of American folk culture,” Thompson noted. Fame after death is not guaranteed. Thompson points out that the two biggest American stars of the 19th century, Sarah Bernhardt and Jinny Lind, are not famous today. Bernhardt starred in theater productions and some of the earliest films ever produced. Lind, called the “Swedish Nightingale,” was an opera singer who became America’s most popular singer. Some cities even named schools and bridges in her honor. One reason Presley, the Beatles, Jackson, Sinatra and Crosby are still popular is modern technology. It is very easy to listen to their music on record albums, radio stations, videos and the internet. Crosby’s song, “White Christmas,” gets played over and over again in the weeks leading up to Christmas. Crosby, like Presley, died in 1977. 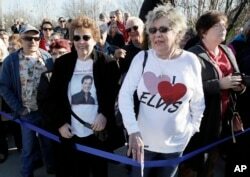 Having a place like Graceland will help keep Presley’s memory alive, Thompson said. People who went there as a five-year-old are likely to remember the experience, even if it did not turn them into fans of Presley, he said. Bruce Alpert reported on this story for VOA Learning English. His report was based on an Associated Press story and other sources. George Grow was the editor. We want to hear from you. Write to us in the Comments Section and share your views on our Facebook Page. Do you know Elvis Presley’s music? If so, do you like it?